Each winter, I attempt to turn myself into a runner. I’m never going to be a ‘fast’ runner because I never completely focus on it and I’m not really the right shape for it either (this is an assumption based on the number of super-skinny blokes you see in fell races), but it does help me to avoid things getting monotonous in the darker months and helps me to keep my fitness. When I realised that my chances of actually taking part in Hit the North were pretty much nil, I decided to enter a ‘big’ fell race so that I’d at least be motivated on my running. 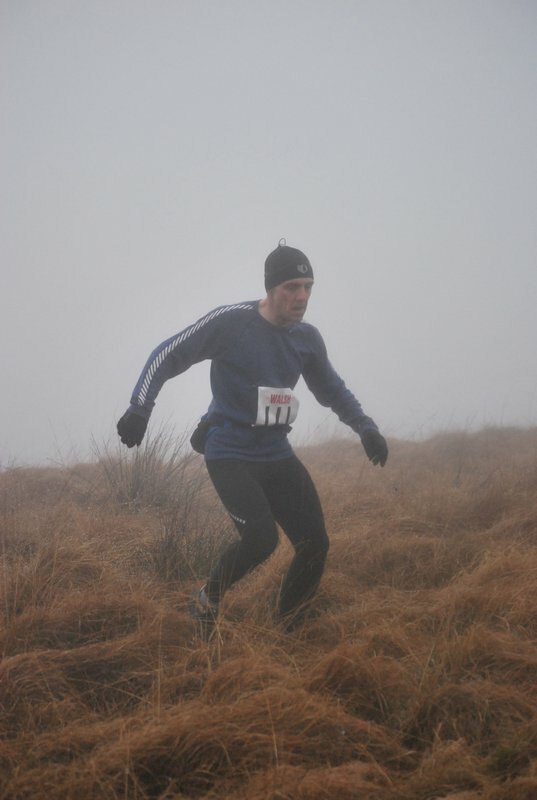 The Winter Hill race is ideal – long at 11-ish miles, very hilly, reasonably epic and local. Oh, and a fiver to enter. At the start of this year’s Winter Hill fell race I was having a wee up against a fence. Obviously I hastily finished my business and joined the rapidly-moving pack towards the back. It wouldn’t matter, there’s plenty of uphill in this race so I’d be able to gain loads of places. Unfortunately this plan was thwarted by the fact that many of the climbs were covered in ice, meaning that long periods of time were spent in a single-file procession. At times it was impossible (for me) to pass runners (and often, walkers) in front because a venture off the grass onto the main track would result in an instant slip onto one’s arse. Constantly thinking about my pathetically-weak ankles on the descents, I negotiated the ice as best I could and tried to push it a bit on the climbs. I’d been worried about the ‘navigation skills required’ stipulation on the FRA website in the past week. I can’t find my way around on featureless moors at the best of times. ‘You’ll be reet as long as the clag doesn’t come down’, Simon tried to reassure me. The ‘clag’ did come down and visibility through the fog was down to a few metres at times. My plan was to follow someone else, basically. Unfortunately the group I was following went the wrong way, realising the error some distance away from the go-wrong point. This meant a detour across another featureless moor, an extra climb and I reckon a bonus mile-and-a-bit. Fantastic. Finally I reached the finish after 2 hours-something. I tucked into a couple of pretty waterlogged free sandwiches and spoke to Vince who told me I was 93rd (yes, ninety-bloody-third! )…not spectacular at all but in reality pretty much where I expected to be, right in the middle. Looking at the results, a woman I passed with around 3 miles to go evidently didn’t go the wrong way and finished about 30 places ahead of me – doh! Good man. I’m running a bit at the mo but getting slower as a result somehow. Not sure how that works. Must try a race again soon.